For some time now, we have been offering our 3D printed coin simulacra with Mifare Classic 1k (716 Bytes writable) NFC tags embedded in them. We can also embed these tags in 3D printed objects for super secret key storage, but I digress… Mifare Classic 1k tags are compatible with most Android devices – except Nexus 4 & 10. 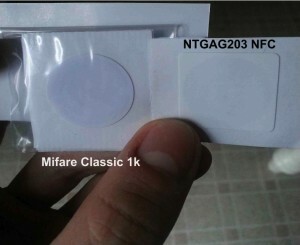 In general, BlackBerry and Windows 8 are not compatible with Mifare 1k, so – for some users – these tags were unusable. We are now offering the option to embed NTGAG203 NFC tags into 3D prints. NTAG203 tags are compatible with all NFC-enabled devices, including BlackBerry and Windows 8. The addressable memory of these tags is only 137 Bytes – approximately the size of a tweet – so we expect our new NFC option to still be suitable for the range of purposes we have previously suggested (storing private keys, public addresses, web addresses, etc). Next PostNext Our Crypto-Coins Are Waterproof & Buoyant!